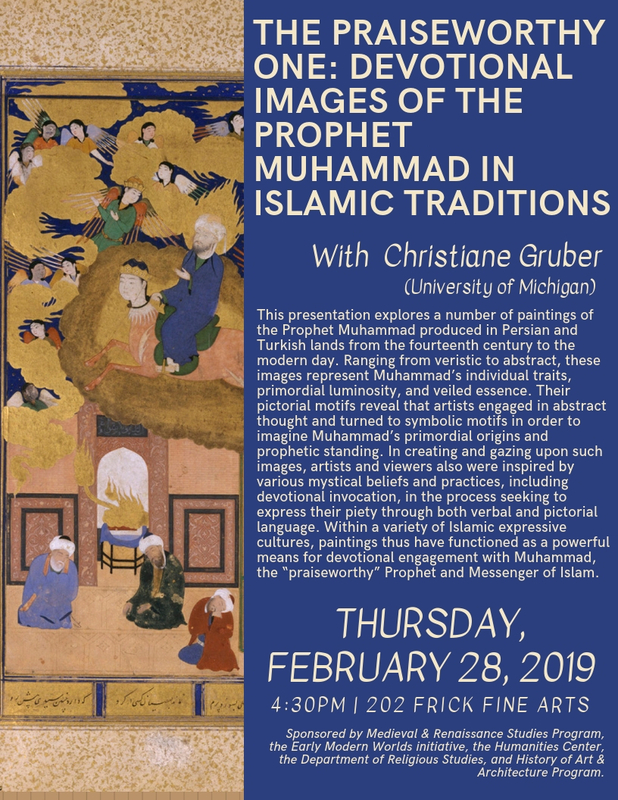 This presentation explores paintings of Muhammad produced in Persian and Turkish lands from the 1300s to the modern day. Ranging from veristic to abstract, these images represent Muhammad’s individual traits, primordial luminosity, and veiled essence. Their pictorial motifs reveal that artists engaged in abstract thought and turned to symbolic imagery to convey Muhammad’s origins and prophetic standing. These images inspired various mystical beliefs and practices. Part of a variety of Islamic expressive cultures, paintings thus have functioned as a powerful means for devotional engagement with Muhammad. Christiane Gruber is professor in the History of Art Department at the University of Michigan, Ann Arbor. Her research interests span medieval Islamic art to contemporary visual culture. She has authored three books and has edited a dozen volumes on Islamic book arts, ascension texts and images, images of the Prophet Muhammad, and modern visual and material culture. Today’s talk is related to her recently published book, The Praiseworthy One: The Prophet Muhammad in Islamic Texts and Images.